SteelSeries might have the official Diablo III license, but that doesn't mean it's the only clicking game in town. 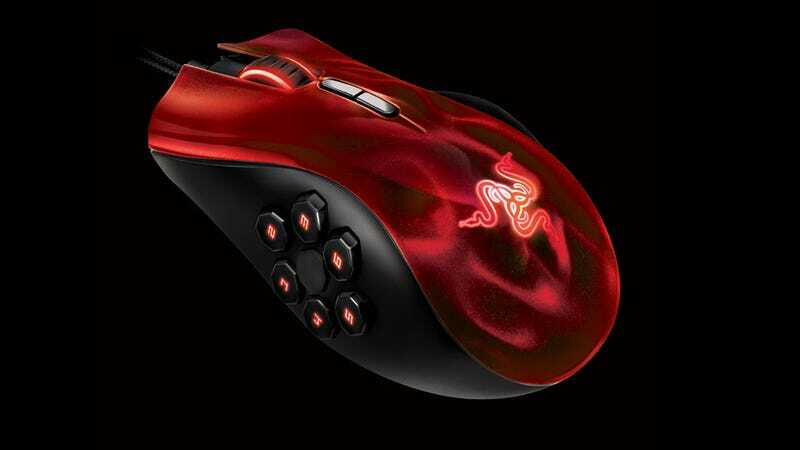 Take the new Naga Hex Wraith Red edition, for instance. The official release calls it "The best weapon to cut down hordes of monsters crawling out from the depths of evil", so Razer's intentions for this recolored version of its popular MOBA-centric gaming mouse are as clear as a crystal jammed into your forehead. Ready to raise hell at a rate of 250 clicks per minute, the Naga Hex Wraith edition is $79.99 worth of action RPG power. I've been hearing a lot about the Razer Naga and Naga Hex lately. Many of the Tera players I've run into over the past couple of weeks swear by the 12 side button Naga, and I've got my original Hex on standby for Diablo III's May 15 release. Perhaps I'll get a chance to see how well it goes click-for-click with SteelSeries' official mouse.